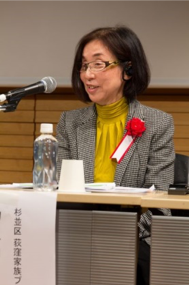 International Longevity Center (ILC) and the Dia Foundation for Research on Ageing Societies (Dia Foundation) cosponsored the International Symposium under the theme of “The elderly play an active role in the 100-year life era”. 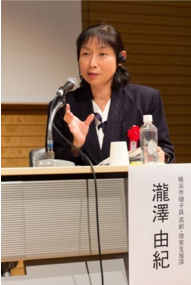 In the first part, as “the latest trend in overseas”, Dr. Yoko Matsuoka who is the Chief Examiner for ILC’s Productive Aging International Comparative Research Team and the Associate Professor in Humanities at the Tokyo Kasei University introduced the current situation in Europe. In Europe, there is a strong sense of crisis with the fast aging and pushing for drastic change from a “welfare state” to a “participatory society”. The current trend of a “participatory society” in Europe is “Aging In Place: Living in a familiar environment until the end of life”. It is shifting from “do something for you” to “support in doing” by supporting independence of individuals and communities. In the UK, by implementing the Care Act 2014, the guiding principle of providing services has changed from a care package (care service at institutions) to self-judgment (judge well-being for yourself). Over 100 projects have launched in cooperation with local governments and professionals, and there is a municipality who had a 65% reduction in the number of care packages needed. In Denmark, by providing rehabilitation prior to nursing care, the condition of 48% of the people who requested nursing care had improved and did not require the care service anymore. In the Netherlands, management of the government’s long-term care insurance has shifted to the local governments. Each local government runs “Socialewijkteams (neighborhood social support teams) ” which listens and takes care of the elderly’s various needs. 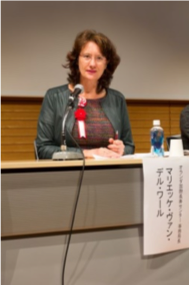 Next, the Director of ILC-Netherlands, Dr. Marieke van der Waal, gave a presentation on “How elderly people in the Netherlands are creating communities”. The Dutch King made a speech at the opening of the parliament in 2013 about the paradigm shift from a “welfare state” to a “participatory society” in which people must be responsible both for themselves and for those around them. Some of the examples to represent this major change include; “remarkable increase of the labor force participate rate for those between 55 and 64 years old”, “various kinds of active support for the elderly by “Socialewijkteams” which is supported by each local government”, “a wide range of volunteer activities thanks to ‘volunteer coordinators’ who play an important role between volunteers and people who request their help”. 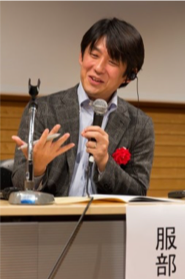 In the second part, the latest trend in Japan “The elderly’s community participation and social contribution in Japan” was introduced by Mr. Shinji Hattori, the Chief Researcher at the Institute for Health Economics and Policy. 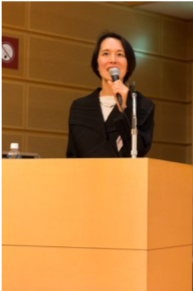 Mr. Hattori also serves as a board member for Productive Aging International Comparative Research Team at ILC-Japan. 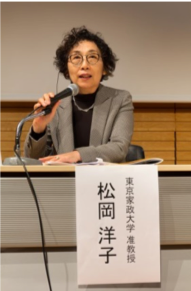 In Japan, the increase in the number of long-term care (support need) recipients slowed down once the Long-Term Care Insurance Law was revised in 2006. However, the prevention-centered system was not as effective as was expected and the speed of increase is expanding again in recent years mainly among care recipients with modest requirements. According to the research, having more contacts with others would help preventing long-term care. They also found that the risk for dementia is lower in the local government areas where there are higher rates of community participation. Social participation helps the elderly to do physical activities but also it could be an opportunity for them to help others. Many elderly people are hoping to be able to help others and the “Life Support Coordinator” tries to find the needs and match them. Life Support Coordinators are located in each area and this is one of the community support projects done by long-term care insurance. Local governments as well as citizens need to realize that when elderly people can continue to do what they hope to do in a familiar environment, that will lead to their self-reliance. Next, two projects were introduced as good examples in Japan. One is the Ogikubo Kazoku Project “Hyakuninriki Salon” in Tokyo. This is a space where both rental housing space and open space are combined. Another is the local activities group “Genki Station” which is supported by the City of Yokohama. Both projects are run by the local citizens on their own initiative, and anyone can join without feeling hesitation or pressure. The third part was a panel discussion by the speakers from the first and the second part. They discussed the role of local coordinators, the future of local activities and expectations from the view point of supporting “participation”, “independence” and “making connections” to the local activities. The venue was full of enthusiasm and the momentum of paradigm shifting to “support in doing” had accelerated.